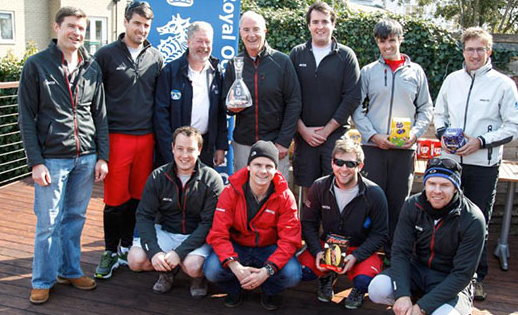 Winner of IRC One was once again Anthony O’Leary’s ‘Antix’ in today’s conclusion of the RORC Easter Challenge 2015 writes James Boyd. While the sun came out for the final day of the RORC Easter Challenge, sadly the wind failed to materialise on the Solent and at 1130 BST Principal Race Office Stuart Childerley hoisted the AP over A announcing an end to the regatta. Fortunately the RORC Easter Challenge is a `coaching regatta’ and use was made of the lost time at the RORC Cowes Clubhouse where Jim Saltonstall’s seminar on the Racing Rules of Sailing was delivered to another packed house. The prizegiving followed, held outside on the club’s terrace where the main silverware was presented, along with a considerable tonnage of Easter eggs. Winner of IRC One was once again Anthony O’Leary’s Antix. However this year the Irish team faced a new change having exchanged their beloved silver hulled Ker 39 – which has twice taken them to Brewin Dolphin Commodores’ Cup victory – for Marc Glimcher’s red-hulled Catapult, the `big boat’ in their winning team last year. “Yesterday it was exciting, great fun to get four races and we had plenty of competition from Tokoloshe and Baraka,” continued O’Leary. “In Class One there seems to be more fast 40s than the previous generation boats now.” The new Antix has a full season ahead, culminating in the Rolex Fastnet Race.